This study provides information designed to aid sectoral social dialogue in the electricity sector. The study is divided into three parts: a summary of the sector’s economic and employment background; an analysis of the social partner organisations in all EU Member States, with emphasis on their membership, their role in collective bargaining, social dialogue and public policy, and their national and European affiliations; and finally, an analysis of the relevant European organisations, particularly their membership composition and their capacity to negotiate. The aim of the EIRO series of representativeness studies is to identify the relevant national and supranational social partner organisations in the field of industrial relations in selected sectors. The impetus for these studies arises from the European Commission’s desire to recognise the representative social partner organisations to be consulted under the provisions of the Treaty on the Functioning of the European Union (TFEU). show how these actors relate to the sector’s European interest associations of labour and business. The impetus for this study, and for similar studies in other sectors, arises from the aim of the European Commission to identify the representative social partner associations to be consulted under the provisions of the Treaty on the Functioning of the European Union (TFEU)(1.4 MB PDF). Hence, this study seeks to provide the basic information needed to set up sectoral social dialogue. The effectiveness of the European social dialogue depends on whether its participants are sufficiently representative in terms of the sector’s relevant national actors across the EU Member States. Only European associations that meet this precondition will be admitted to the European social dialogue. To accomplish these aims, the study identifies the relevant national social partner organisations in the electricity sector, via a top-down approach (listing the members of the European affiliations) and a bottom-up approach (using national correspondents from the European Industrial Relations Observatory (EIRO). This involves clarifying the unit of analysis at both national and European level of interest representation. The study includes only organisations whose membership domain is ‘sector-related’. The study follows the conceptual and methodological approach of the EIRO series of representativeness studies. and/or it has requested to be consulted under Article 154 TFEU. National associations are considered relevant sector-related interest associations if they meet both criteria A and B. A: The association’s domain relates to the sector. B: The association is: (1) either regularly involved in sector-related collective bargaining, and/or (2) affiliated to a ‘sector-related’ European association of business or labour on the Commission’s list of European social partner organisations consulted under Article 154 of the TFEU and/or which participates in the sector-related European social dialogue. Organisations are considered ‘sector-related’ if their membership domain relates to the sector in one of the ways displayed in Figure 1. A more detailed description as to how this is established can be found in the methodological annex. As regards criterion B.2, it must be said that taking affiliation to a European social partner organisation as sufficient to determine a national association as a social partner does not necessarily imply that the association is involved in industrial relations in its own country. Although this selection criterion may seem odd at first glance, a national association that is a member of a European social partner organisation will become involved in industrial relations matters through its membership of the European organisation. Furthermore, it is important to assess whether the national affiliates to the European social partner organisations are engaged in industrial relations in their respective countries. Affiliation to a European social partner organisation and/or involvement in national collective bargaining are of utmost importance to the European social dialogue, since they are the two constituent mechanisms that can systematically connect the national and European levels. Data have been collected through the EIRO network, which approached the national organisations with a standard questionnaire. In order to ensure the quality of the information gathered, several verification procedures and feedback loops with the different parties involved (European and national level social partner organisations, the European Commission, Eurofound) have been applied. European Federation of Public Service Unions (EPSU). European Union of the Electricity Industry (Eurelectric). In addition, the study considers any other sector-related European associations with sector-related national associations as defined below. According to a report by the European Commission in 2010 (1.23MB, PDF), the electricity sector employs more than 800,000 people in Europe. The large majority of electricity workers have employee status and full-time work is predominant. Some 78% of the workers are men, with 69% of the workforce having a low or intermediate education level. The size of enterprise varies widely between countries. While, in some countries, one or a few large companies dominate, in others, smaller companies play a more significant role. The Commission’s 2010 report and a report on industrial relations in the electricity sector by Eurofound in 2012 (404KB PDF) highlight that restructuring in the electricity sector since the second half of the 1990s has mainly been caused by the EU liberalisation of network industries. The first steps towards restructuring were taken with the 1996 Directive (96/92/EC), which came into effect in 1999. Further measures, introduced in 2003, were made into national law by 2004, with the provisions on the complete liberalisation of the market coming into force in 2007, including for domestic end-users. The most important recent European initiatives to transform the electricity sector are those included in the 2009 ‘third package’ to develop and reinforce further the internal market for electricity and gas, as well as the strategy for the promotion of renewable energy sources (RES) introduced in 2001. This legislation was explicitly aimed at benefiting customers and promoting employment in sectors heavily dependent on energy use, through lower prices generated by greater competition. At the same time, there were concerns that greater competition would lead to job losses and poorer working conditions in energy businesses. Besides, the EU commitment to reduce greenhouse gas emissions by 20% will require major technological change, and puts pressure on workers with regards to skill needs. The study by ECOTEC (2007) on the impact of the opening of electricity and gas markets on employment in the EU (215KB PDF) concludes that the process of privatisation and liberalisation has had the effect of significantly reducing employment in the electricity sector. Radical shifts in employment within the electricity sector have been observed. Utilities in the EU15 (Member States before 2004) lost nearly 250,000 jobs (more than 25%) from 1995 to 2004. Around 50,000 jobs, or one-sixth of the workforce, were lost during the same period in the EU12 (Member States that joined between 2004 and 2012). 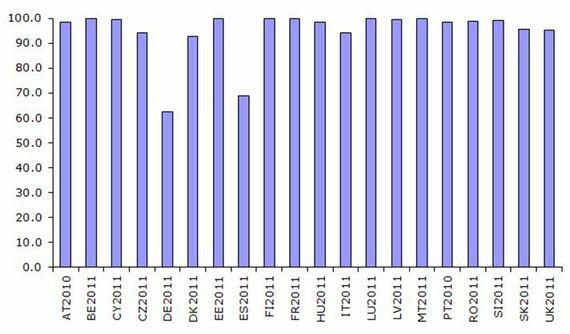 According to the ECOTEC study, the exact impact of liberalisation on these trends varies between countries and is hard to isolate, as it has not been the only factor responsible for the decline. Technological changes (such as the transition to less labour-intensive electricity generation), the growing importance of a few international market leaders, expansion abroad, and a trend of consolidation among the smaller municipal utilities have also led to drastic cuts in employment. Privatisation, commercialisation and outsourcing can be seen as consequences of liberalisation, but they may also occur regardless. Furthermore, liberalisation is in its early stages in many of the EU12 Member States, and the process is expected to have a profound impact on employment. According to ECOTEC (2007), the impact of liberalisation on employees is diverse. Job cuts have mostly targeted low-skilled personnel (maintenance, customer service and administration, low-skilled technicians). Demand has grown for highly educated and experienced technicians and legal experts. The share of female workers has increased, partly as a result of emerging new occupational profiles being more attractive to female employees than traditional ‘technical’ jobs. Many countries have seen large proportions of their older energy sector workforce retire early in response to corporate strategies seeking reductions in staff through early retirement. Young workers and technical graduates have suffered as new employment opportunities in the sector have declined in the context of restructuring and cost cutting. Tables 1 and 2 give a general overview of the development of the sector from 2001 to 2011. They present figures on companies, employment and employees in the sector and in relation to the national economy. Most of the data come from national sources (and are collected by national centres). In light of the trends highlighted by Eurofound (2012), it is notable that the number of companies has increased in 17 of the 21 countries, where data was available, since 2001. This reflects the shift from vertically integrated, and often monopolistic, operators at national level to a plurality of smaller companies operating in the various sector segments – generation, transmission, distribution and marketing. In Denmark, Sweden and the Netherlands, the number of companies has decreased, although the drop in the number of Dutch companies is almost insignificant (-2). In Denmark and Sweden, the decrease may be linked to an employment decrease. As for Malta, there is only one company. Source: EIRO national contributions (2012), national statistics. For a detailed description of sources, please refer to the national reports. The data in Tables 1 and 2 show that female employment is lower than male employment in all countries with available data. The tables also show that only 6 countries (Belgium, Germany, Spain, Luxembourg, Slovakia and the UK), out of the 18 with available information, recorded an increase in overall employment from 2001 (or the last figure available) to 2011. 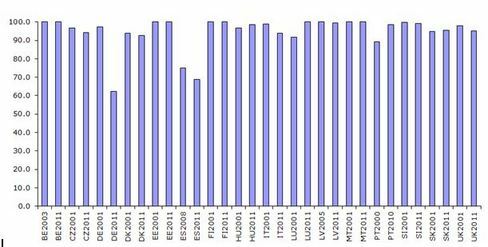 Data on change in employee numbers from 2001 to 2011 show the same pattern. On the other hand, Cyprus and the Netherlands, which do not provide figures on employment from 2001 to 2011, record an increase in the number of employees. None of the Member States records an increase in employment and a decrease in employees. Data provided by national centres, in Figure 2, show the change in the share of employees in employment from 2001 to 2011. According to available data, the share of employees in employment has remained very stable in the majority of countries. The exception is Germany, where the share of employees in employment decreased from 97% to 62%. Of 16 countries with available data, 8 have recorded a decrease of employees in employment, while in 4 countries it has slightly increased. In Belgium, Estonia, Finland and Malta, the share of employees in employment has remained stable at 100%. Source: Own elaboration according to EIRO national contributions (2013). For a detailed description of sources, please refer to national reports. The small size of the electricity sector, as defined in this study, means that figures from the European Labour Force Survey (Eurostat) are not available for several countries. Accordingly, it is not possible to provide accurate figures on recent employment developments in the sector. Figures available from this source show that the crisis has not particularly affected the electricity sector. Thus, employment has remained relatively stable or has even increased slightly. If other sources, such as the European Business Statistics (Eurostat), are considered, aggregate figures for the electricity sector are available only for 2008 and 2009. According to the European Business Statistics, employment decreased from 894,200 to 885,500 from 2008 to 2009. 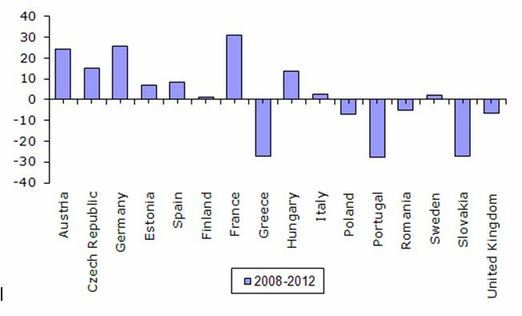 Note: Figures from Italy and the United Kingdom are for 2011–2012. Source: Labour Force Survey (2013)Figure 4 illustrates the share of employees in employment in the countries with available data for 2011. The figure shows that self-employment and other non-employee relationships (such as apprentices and freelancers) are only widespread in countries such as Germany and Spain, with more than 30%. In the other countries, self-employment and other non-employee relationships appear to be low. Source: Own elaboration according to EIRO national contributions (2012). For a detailed description of sources, please refer to national reports. The study uses the quantitative data on membership and relative strength collected through the EIRO network of correspondents from the categories listed in Table 3. Sectoral density: Number of active members in employment in electricity sector divided by total number of employees in electricity sector. Sectoral density (companies): Number of member companies in electricity sector divided by the total number of companies in the electricity sector. Tables A2 and A3 in Annex 2 present data on employee organisations’ domains and membership strength. The tables list all sector-related organisations that are either involved in collective bargaining and/or affiliated to one of the European-level organisations. 16 have 4 or more. Only six unions (5% of all the unions) demarcate their domain in a way that is congruent with the sector definition. This fact implies that statistical definitions of business activities of the sector differ from the lines along which employees identify their interests. telecommunications, sport and real estate sectors (Syndicat Services et Energie, OGBL in Luxembourg). In other cases, it is due to the existence of unions that cover only a part of the sector (KESA in Estonia, SKE ‘Solidarność’ in Poland and ZOES in Slovakia). The domain descriptions of all the unions are shown in Table A4 in Annex 2. Source: Author’s own based on EIRO national contributions (2013). Inter-union competition is recorded in Estonia, Finland, France, Italy, Portugal and Sweden, which, in most cases, is over-recruiting members. In France, unions compete for members but also for their subsequent support in the workplace elections that determine which trade union has a seat on the Works Council. According to the French national report, competition is expected to increase in 2013, when a new representativeness regulation, based on the outcomes of workplace elections, will come into force. Membership of the sector-related trade union is, in principle, voluntary in the 27 countries under consideration. The numbers of active trade union members differs widely, ranging from more than 2,061,198 (for Ver.di in Germany) to only a few dozen (such as SYVAIK in Cyprus). This considerable variation reflects differences in the size of the economy and the comprehensiveness of the membership domain, rather than the ability to recruit members. Therefore, density is the measure of membership strength, which is more appropriate for comparative analysis. In this context, it should be noted that density figures in this section refer to net ratios, which means that they are calculated on the basis of active members (employees) only, rather than taking all union members (those in a job and those who are not) into account. This is mainly because research usually considers net union densities as more informative compared to gross densities, since the former measure tends to reflect unionisation trends among the employees more quickly and accurately than the latter (only the employees are capable of taking industrial action).When looking at sector density (again referring only to active members), it is important to differentiate between the trade unions’ sectoral density and their domain density. The domain or overall density must be higher than the sectoral density if a trade union organises a particular part of the sector – that is, where the trade union’s membership domain is sectionalist – and equal if a trade union organises the whole sector as it is defined in the study – that is, where the trade union’s membership domain is congruent. In this study, we analyse only the sectoral density. 23% (14) of the trade unions record a sector density rate of less than 5% of employees in the sector. 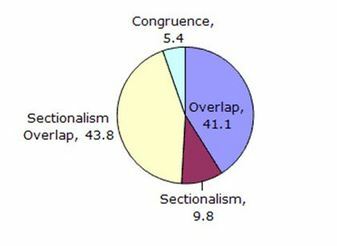 Generally, low and very low sectoral densities (fewer than 10%) are recorded in countries where there is a fragmented union landscape, and the domain of the unions overlap with each other. This is the case in Spain, Poland or Romania. Besides, in other countries where there are several trade unions whose domains overlap, such as Finland or Belgium, we find unions recording relatively high sectoral densities together with unions recording low sectoral densities. In Austria, for example, none of the unions’ domains overlaps with those of any of the others. In Austria trade unions record high sectoral densities. In Greece, where there is only one sectoral union, this trade union records a sectoral density close to 100%. Tables A5 and A7 in Annex 2 present membership data for the employer organisations in the electricity sector. Sectoral employer organisations are identified in all the European Member States. In total, 48 sector-related employer organisations are identified. However, it is worth noting that three of these organisations included in the EIRO national reports are companies rather than employer associations (EAC in Cyprus, PPC in Greece and Enemalta in Malta). Since, in these countries, these companies concentrate the highest share of the electricity sector, the national reports include them as employer associations. Moreover, these companies are involved in collective bargaining and are affiliated to the European social partner Eurelectric, (even though PPC in Greece is indirectly affiliated by means of the employer association HELAS). In the case of EAC in Cyprus and Enemalta in Malta, the companies are also consulted by the government in sector-related matters. 3 countries record 4 employer organisations or more. In seven countries (Estonia, Spain, Lithuania, Latvia, Poland, Portugal and the UK), none of the sectoral employer associations included in the study is party to collective bargaining (see Table A5 in Annex 2). In Germany, Denmark, Greece, Hungary Ireland, Italy, Netherlands and Poland, at least one of the employer organisations included is not involved in collective bargaining. Generally, business organisations may also deal with interests other than those related to industrial relations. Organisations specialised in matters other than industrial relations are commonly defined as ‘trade associations’ (see TN0311101S). Bearing this in mind, all the 18 organisations not involved in collective bargaining (see Table A5 in the Annex 2), either primarily or exclusively act as trade organisations in their country although, in the case of VAEU in Germany, it concludes collective agreements by means of their regional member associations. Such sector-related trade associations thus account for a significant share of the employer organisations recorded in the study (36% of all the organisations). All these organisations, except VAEU in Germany, are members of Eurelectric. (VAEU is included in the study because it concludes collective agreements by means of their regional member associations.) In this sense, it must be stressed that, according to our selection criteria described above, all national organisations affiliated to Eurelectric, the EU-level employer association, are included in the study, irrespective of whether they are involved in collective bargaining. With regard to the domain patterns of the employer organisations, it is observed that its domain tends to be narrower than the domain of the trade unions. Of all of the organisations for which related information is available, 42.5% have overlap and 22.5% have sectional overlap compared with 42% and 43% respectively in the case of the unions. heat-supplier companies and secondary vocational schools (ZZES in Slovakia). However, only one employer organisation has a cross-sectoral domain (IBEC in Ireland). Sectional overlap is usually due to domain demarcations that cover one subsector of electricity (such as production and distribution), plus another sector or activities such as transport and distribution of gas (Synergrid and FEBEG in Belgium, ENA in United Kingdom) or gas and telecommunications (Federutility in Italy). In other cases, it occurs because employer organisations that represent only some kinds of companies within the electricity sectors, such as public municipalities (VKA in Germany, KFS in Sweden) or private companies (EFA in Sweden), also cover other activities or sectors beyond the electricity sector. transmission, distribution and trade of electricity (ZPEC and ZPE in Poland). This means that the domain of these organisations largely focuses on the electricity sector as defined above. However, it cannot be ruled out that these organisations may also organise companies of a contiguous sector, or do not really organise the entire sector. No sector-related employer organisations rely on obligatory membership. Source: Author’s own, based on EIRO national contributions (2013). In countries with a pluralist structure for employer organisations (Germany, Italy, Poland, Romania and Sweden), these organisations have usually managed to arrive at non-competing relationships. In the case of Ireland, there is no rivalry as only IBEC has a negotiation licence to conclude collective agreements. Something similar happens in the Netherlands, where there is no rivalry since one of the two existing organisations, Energie-Nederland, does not conclude collective agreements. In other countries (Belgium, Denmark and the UK), the activities of these organisations are complementary as a result of inter-associational differentiation by their membership demarcation. As far as the sectoral density of the employer organisations is concerned, it must be noted that figures, in terms of employees, are available only for 19 organisations. In terms of companies, figures are available for 30 organisations. When information is available, the sectoral domain densities of companies are, in all cases, lower than the densities in terms of employees. This may indicate a slightly higher propensity of the larger companies to associate, as compared to their smaller counterparts. Accordingly, 47% (9 out of 19) of the organisations with available data show a sectoral domain density exceeding 50% in terms of employees. However, in terms of companies, only 23% (7 out of 30) show a sectoral domain density exceeding 20%. 35% show participation both in single and multi-employer bargaining. 11% participate in single and multi-employer bargaining. As has been mentioned before, this implies that sector-related trade associations account for a significant share of the employer organisations recorded in the study (36% of all the organisations). Source: Author’s own, based on EIRO national contributions (2012). The data presented in Table 4 provide an overview of the system of sector-related collective bargaining in the 27 countries under consideration. The importance of collective bargaining as a means of employment regulation is measured by calculating the total number of employees covered by collective bargaining as a proportion of the total number of employees within a certain segment of the economy (Traxler et al, 2001). Accordingly, the sector’s rate of collective bargaining coverage is defined as the ratio of the number of employees covered by any kind of collective agreement to the total number of employees in the sector. In terms of the sector’s collective bargaining coverage, 15 of the 22 countries with available data record high rates of collective bargaining coverage, exceeding 80%. These countries are Austria, Belgium, Cyprus, Finland, France, Greece, Hungary, Ireland, Italy, Lithuania, Malta, the Netherlands, Portugal, Sweden and Slovenia. Belgium, Denmark and Romania could be added to this group of countries since they record a coverage rate of around 70%. The remaining countries with available information (the Czech Republic, Latvia, Slovakia and the UK) record a rate of collective bargaining coverage that varies between 40% and 60%. This shows a relatively high collective bargaining coverage system among European countries in the electricity sector. Generally, several factors which sometimes interact with each other, such as the predominance of multi-employer bargaining or the existence of pervasive extension practices, explain the highest coverage rates. However, these factors are not so determinant as in other sectors in explaining high coverage rates of collective bargaining. Accordingly, we find countries such as Greece, Ireland, Lithuania and Portugal, which record high coverage rates of collective bargaining, where single-employer bargaining prevails, and the use of extension practices is limited or non-existent. represented on ‘corporatist’ (in other words tripartite) committees and policy consultation boards. This study considers only cases of consultation and corporatist participation which explicitly relate to sector-specific matters. Consultation processes can be wide-ranging and, therefore, the organisations consulted by the authorities may vary according to issues, and also depend on changes in government. Moreover, consultation may be occasional rather than regular. Some 78 of the 98 (80%) sector-related unions with available data are consulted. Authorities consult unions in 23 of the 27 countries where sector-related trade unions are recorded. Unions are not consulted in Greece and Estonia. Information is not available for Portugal and Luxembourg. Unions are regularly consulted in Austria, Belgium, Bulgaria, Denmark, Finland, France, Hungary, Italy, Latvia, Malta, the Netherlands, Sweden, Slovenia and the UK. Since a multi-union system has been established in 25 of the 27 countries with sector-related trade unions, it cannot be ruled out that the authorities favour certain trade unions over others, or that the unions compete for participation rights. In some countries with a multi-union system where a noticeable practice of consultation is observed, any existing trade unions may take part in the consultation process. By contrast, in Belgium, Bulgaria, the Czech Republic, Estonia, France, Italy, Malta, Sweden, Slovenia and the UK only part of the sector-related trade unions are consulted. Authorities consult 37 of the 42 (90%) employer organisations for which related data are available. Employer organisations are consulted by the government in all the countries with sector-related organisations except Hungary, where sectoral social dialogue is bipartite, and authorities are not involved. In Greece and Luxembourg, there is no information about this issue. Organisations are regularly consulted in Austria, Bulgaria, the Czech Republic, Denmark, Finland, Ireland, Italy, Latvia, Malta, Sweden and the UK. In seven of the countries with a multi-organisation system where a practice of consultation is recorded, all the existing employer organisations may take part in the consultation process. However, in Italy, Poland and Sweden, only some of the existing employer organisations take part in the consultation process. energy policy issues (Latvia, Poland, Slovenia and Slovakia). In charge of extension of collective agreements, disciplinary role, etc. Bipartite, but Secretary is paid by the Ministry. Public Administration Collective Bargaining Unit (PACBU) within the Ministry of Finance. Each of the parastatal corporations or enterprises receives ad hoc instructions from the PACBU, which serve as guidelines to be followed during the collective bargaining process. The PACBU’s primary aim is to ensure that the financial side of collective agreements carried out by parastatal entities reflects government wage policy. Unite has a board member; Unison states that it is represented at EU Skills. Individual employers (such as E.On UK and UK Power Networks) are members of board. ENA states that it is represented at EU Skills, and UK Energy states that it is an affiliate. Individual employers (such as Magnox) are represented on the board. As outlined in greater detail below, two sector-related European employee associations, namely IndustriAll Europe and EPSU, and one employers’ association, Eurelectric, are particularly significant in the electricity sector; they are listed by the European Commission as social partner organisations consulted under Article 154 of the TFEU. Hence, the following analysis will concentrate on these organisations while providing supplementary information on others which are linked to the sector’s national industrial relations actors. IndustriAll Europe is affiliated to the European Trade Union Confederation (ETUC) and organises workers from the manufacture, mining and energy sectors on the European level. It represents 194 national organisations and 7,314,027 workers from 39 European countries. EPSU organises workers from the public sector. It represents more than 265 unions and eight million public service workers from 40 countries. Eurelectric represents the common interests of the electricity industry at pan-European level, plus its affiliates and associates on several other continents. It has over 30 full members which represent the electricity industry in 32 European countries. Table 6 shows membership-related trade unions for IndustriAll drawn from the country reports. This membership list is confined to the sector-related associations of the countries under consideration; hence, it does not include trade unions affiliated to the European-level organisations that do not have any members in the electricity sector. The membership of the employee organisations is obtained through the membership list provided by the organisations and a further check of the membership lists published on the organisations’ webpages. In all countries, except Latvia, the Netherlands and Malta, there is at least one sectoral affiliation to IndustriAll. IndustriAll has 44 direct affiliations from the countries under consideration, and all of them participate in sectoral collective bargaining except LBC in Belgium. Moreover, all the unions affiliated to IndustriAll cover the sector in all their countries’ regions except in the case of ELA-HAINBAT in Spain and BDSZ in Hungary. Therefore, 39% of the unions listed in Tables A2 and A3 in Annex 3 are directly affiliated to IndustriAll. According to the information provided by the national correspondents, there are several members of IndustriAll which do not have members in the electricity sector. For this reason, they are not included in Table 6. However, they are shown in Table 6a, below. Table 7 documents a list of membership-related trade unions for EPSU drawn from the country reports. Again, this membership list is confined to the sector-related associations of the countries under consideration, hence it does not include trade unions affiliated to the European-level organisations that do not have any members in the electricity sector. The membership of employee organisations is obtained through the membership list provided by the organisations and a further check of the membership lists published on the organisations’ webpages. In all countries, except Cyprus, Greece and Luxembourg, at least one sectoral affiliation to EPSU is found. In Cyprus there are no sectoral affiliations to EPSU, although EPOPAI is indirectly affiliated to EPSU through its federation OHO-SEK. EPSU has 49 direct affiliations from the countries under consideration, and 48 of them are involved in sectoral collective bargaining. Moreover, all the unions affiliated to EPSU cover the sector in all the regions of their countries. Accordingly, 44% of the unions listed in Tables A2 and A3 are directly affiliated to EPSU. According to the information provided by the national correspondents, there are several members of EPSU which do not have members in the sector. For this reason, they are not included in Table 7. However, they are shown in Table 7a, below. It is important to note that in the case of France, FPSPSS-FO, CGT-SP and INTERCO-CFDT could have members in municipal companies within the electricity sector. According to the French correspondent, it is possible that some employees working in an electrical company managed by a municipality could be covered by one of those unions; however, those are exceptional cases. In the case of Luxembourg, the correspondent there notes that LCGB (a confederation) is a member of EPSU, but the federation that is active in the electricity sector, namely LCGB Industry, is not a member of EPSU. Table 8 lists the employer organisations that are members of Eurelectric. Again, this membership list is confined to the sector-related associations of the countries under consideration; hence it does not include employer organisations affiliated to the European-level organisations which do not have any members in the electricity sector. In total, Eurelectric has 30 direct affiliations, 11 of which participate in sectoral collective bargaining. Moreover, it is worth noting that there are two companies included in their affiliations (AHK/EAC in Cyprus and Enemalta Corporation in Malta). Accordingly, 62% of the employer organisations listed in Tables A5 and A6 in Annex 2 are directly affiliated to Eurelectric. Thus, it covers the sector’s most important sectoral employer organisations. The third criterion of representativeness at European level refers to the organisations’ capacity to negotiate on behalf of their members. They have been asked whether or not they have the capacity to negotiate on behalf of their members. IndustriAll and EPSU have been given a general mandate to negotiate on behalf of their members. In the case of Eurelectric, it has been given a general mandate to negotiate on behalf of its members, although it states that it does not negotiate collective agreements with the European trade union federations. As final proof of the weight of IndustriAll, EPSU and Eurelectric, it is useful to look at the other European organisations to which the sector-related trade unions and employer organisations are affiliated. The affiliations of the trade unions are listed in Table A3 in Annex 2, and there we find several European organisations other than IndustriAll and EPSU. Accordingly, there are five European organisations mentioned here, which cover at least three countries: UNI Europa, the European Federation of Food, Agriculture and Tourism Trade Unions (EFFAT), the Council of European Professional and Managerial Staff (Eurocadres), the European Federation of Building and Woodworkers (EFBWW) and the European Transport Workers’ Federation (ETF). The presence of these organisations reflects the overlapping domains of many trade unions, because these organisations do not claim to attract unions belonging to the electricity sector. This overview of affiliates underlines the principal status of IndustriAll and EPSU as the sector’s labour representative. A similar review of the membership of the national employer or business associations is shown in Table A6 of Annex 2. Some have associations at European level other than Eurelectric. There are three European associations that cover at least three countries: GEODE, Eurogas and CEEP. As in the case of the trade unions, the presence of these organisations reflects the overlapping domains of some employer organisations because these organisations do not claim to attract employer organisations from the electricity sector. In conclusion, Eurelectric is by far the most important sector-related European organisation since it covers 27 Member States under discussion here. A pluralist associational system prevails on the employee side of the electricity sector, where 113 unions have been identified. Only 1 sector-related union is recorded in 2 countries, 2 unions in 7 countries and 3 unions are present in 2 countries. However, 16 countries record 4 or more sector-related unions, thus showing a fragmented landscape. On the employer side, a less fragmented system exists. Thus, 15 countries record only 1 employer organisation, while 7 countries record 2 employer organisations, 2 countries record 3 employer organisations, and 3 countries record 4 employer organisations or more. Differences between unions and employer associations also appear with regard to their domain demarcation. In the case of the unions, overlap and sectional overlap are the dominant domain patterns while, in the case of the employer associations, domain tends to be narrower. Thus, 41% of unions have an overlap domain and 44% have a sectional overlap domain, compared to 42% and 22% respectively in the case of the employer associations. On the other hand, 22% of all the employer organisations with available information show a domain more or less congruent with the sector definition, while only six unions (5% of all the unions) demarcate their domain in a way that is congruent with the sector definition. With regard to the densities of the trade unions, the situation differs widely among countries and unions. 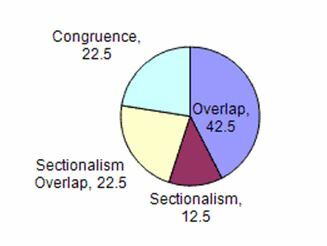 Generally, low and very low sectoral densities (fewer than 10%) are recorded in countries where there is a fragmented union landscape, and the domain of the unions overlap with each other. In other countries where there are several trade unions whose domains overlap, such as Finland or Belgium, we find unions recording relatively high sectoral densities alongside unions recording low sectoral densities. With respect to the employer organisations, figures are available only for a few organisations, especially in terms of employees (available for only 19 organisations). When information is available, the sectoral domain densities in terms of companies are, in all cases, lower than the densities in terms of employees. This may indicate a slightly higher propensity of the larger companies to associate, as compared to their smaller counterparts. Accordingly, 47% (9 out of 19) of the organisations with available data show a sectoral domain density exceeding 50% in terms of employees. However, in terms of companies, only 23% (7 out of 30) show a sectoral domain density exceeding 20%. Collective bargaining coverage is relatively high in the electricity sector. Some 18 of the 22 countries with available data record high rates of collective bargaining coverage, exceeding 70%. The remaining countries with available information record a rate of collective bargaining coverage which varies between 40% and 60%. Several factors, which sometimes interact with each other, such as the predominance of multi-employer bargaining or the existence of pervasive extension practices, explain the highest coverage rates. However, these factors are not as decisive as in other sectors in explaining the high coverage rates of collective bargaining. Accordingly, in countries such as Greece, Ireland, Lithuania and Portugal, which record high coverage rates of collective bargaining, single-employer bargaining prevails, and the use of extension practices is limited or non-existent. As far as participation in public policy is concerned, a relatively high proportion of unions (78 of the 98 unions with available data) are consulted. On the employer side, authorities consult 37 of the 42 (90%) employer organisations for which related data are available. On the other hand, the study reveals that genuinely sector-specific bodies have been established in 16 of the 27 countries under consideration. In the light of the present study, the three European social partners under consideration, IndustriAll, EPSU and Eurelectric, fulfil the above criteria. As seen from the bottom-up mapping of individual organisations, IndustriAll has 44 direct affiliations (39% of the unions identified in the study) in 24 European Member States, and all of them participate in sectoral collective bargaining except LBC in Belgium. In the case of EPSU, 49 direct affiliations are identified (44% of the unions identified in the study), 48 of which are involved in sectoral collective bargaining. Finally, Eurelectric has 30 direct affiliations (46% of the employer organisations identified in the study) in the 27Member States under discussion, 11 of which participate in sectoral collective bargaining. Moreover, it is worth noting that no further European-level actors with a comparable coverage could be found on either side of the industry. Top-down and bottom-up analyses of the electricity sector in these EU27 show that IndustriAll and EPSU for the employees and Eurelectric for the employers ought to be regarded as the most important EU-wide representatives of the employers’ and employees’ within the sector. The study first identifies the relevant national social partner organisations in the electricity sector, subsequently analysing the structure of the sector’s relevant European organisations, in particular their membership composition. This involves a clarification of the unit of analysis at both the national and European level of interest representation. The study includes only organisations whose membership domain is ‘sector-related’. The association’s domain relates to the sector. The association is: either regularly involved in sector-related collective bargaining, and/or affiliated to a ‘sector-related’ European association of business or labour on the Commission’s list of European social partner organisations consulted under Article 154 of the TFEU and/or which participates in the sector-related European social dialogue. 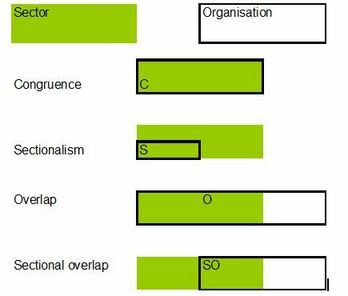 Sectional overlap: the domain/purview covers part of the sector plus (parts of) one or more other sector. As regards criterion A, the domains of the associations are likely to vary from the precise NACE demarcation of the electricity sector. To ascertain whether the domain of an association relates to the sector, the following questions must be answered by the EIRO national correspondent based on interviews conducted with the respective national organisations. This question refers to the economic sub-activities of the NACE code chosen. Some organisations may limit their domain to some of the sub-activities. … cover employees in all (legal) forms of enterprises (for instance: public ownership, private ownership, multinationals, domestic companies, etc.) (of course, only insofar as they exist in the sector)? Some organisations may limit, for instance, their domain to public sector companies/employees only. … cover employees in enterprises of all sizes in the electricity sector? Some organisations (notably employer organisations) may limit their domain to enterprises by size class (such as SMEs only). … cover the electricity sector in all the regions? This question refers to geographical coverage. Some organisations may not be national in scope and limit their domain to some of the regions. ... cover all occupations in the electricity sector? Some organisations (notably trade unions) delimit their domain to certain occupations only. ... cover blue-collar and white- collar employees in the electricity sector? Some organisations (notably trade unions) cannot potentially cover certain types of workers, like self-employed, free-lancers, temporary agency workers, etc. … also cover employees or enterprises outside the electricity sector? Some organisations may enlarge their domain to other activities not included in the electricity sector. As regards criterion B.2, it must be said that taking affiliation to a European social partner organisation, as sufficient to determine a national association as a social partner, does not necessarily imply that the association is involved in industrial relations in its own country. Although this selection criterion may seem odd at first glance, a national association that is a member of a European social partner organisation will become involved in industrial relations matters through its membership of the European organisation. Furthermore, it is important to assess whether the national affiliates to the European social partner organisations are engaged in industrial relations in their respective country. Affiliation to a European social partner organisation and/or involvement in national collective bargaining are of utmost importance to the European social dialogue, since they are the two constituent mechanisms that can systematically connect the national and European levels. Extending a collective agreement to employees who are not unionised in a company covered by the collective agreement is a standard rule of the International Labour Organisation (ILO), aside from any national legislation. If employers did not extend a collective agreement concluded by them, even when not formally obliged to do so, they would set an incentive for their workforce to unionise. The collection of quantitative data is essential for investigating the representativeness of the social partner organisations is done two-fold through a bottom-up (EIRO correspondents) and a top-down approach (list of members of European Social Partners at national level). Unless cited otherwise, this study draws on country studies provided by EIRO, a network of national industrial relations experts, based on a standard questionnaire, which they have completed by contacting the sector-related social partner organisations in their countries. The contact was generally made via telephone interviews in the first place, but might also have been established via email. In case of non-availability of any representative, the national correspondents were asked to fill out the relevant questionnaires based on secondary sources, such as information given on the social partner’s website, or derived from previous research studies. It is often difficult to find precise quantitative data. In such cases, the EIRO national centres are requested to provide rough estimates rather than leaving a question blank, given the practical and political relevance of this study. However, if there is any doubt over the reliability of an estimate, this will be noted. personal estimates made by representatives of the respective organisations. First, the coordinators, in collaboration with Eurofound, will check the consistency of the national contributions. Second, Eurofound sends the national contributions to both their national members of governing board, as well as to the European-level sector-related social partners’ organisations. The peak-level organisations then ask their affiliates to verify the information. Feedback received from the sector-related organisations is then taken into account, if it is in line with the methodology of the study. Third, the complete study is finally evaluated by the European-level sectoral social partners and Eurofound’s Advisory Committee on Industrial Relations, which consists of representatives from both sides of industry, governments and the European Commission. No affiliations at international or European level. Blue-collar employees in the private sector from the following industries: electricity, metalworking, mining, energy (other than electricity), agriculture, food-processing, tobacco, chemicals, glass production, paper, textile and clothing, vulcanisation, mineral oil and gas, waste, and temporary agency workers. All employees in the electricity sector plus workers employed in the following companies operating outside the electricity sector: ČEZ Teplárenská, Severočeské doly – kolejová doprava, I+C Energo, Energetické opravy, Energotrans. All employees in the electricity sector plus workers in telecommunications, sport, real estates, etc. Qualified workers with at least secondary education within a wide range of sectors beyond electricity such as automotive industry, metallurgy, telecommunications, chemical industry, etc. Companies producing, transmitting, distributing and trading energy of any kind and also their subsidiaries being employer regardless of their activity.